Writer, storyteller, editrix. Author of the Anna, Banana chapter-book series, the picture books The Teacher's Pet and Watch Out for Wolf!, the YA novel Always Forever Maybe, and more. Fan of dogs and ice cream. Anica Mrose Rissi grew up on an island off the coast of Maine, where she read a lot of books and loved a lot of pets. She now tells and collects stories, makes up songs on her violin, and eats a lot of cheese with her friends in Princeton, New Jersey. As a former book editor turned full-time writer and storyteller, Anica has spoken with kids and adults across the country about all pieces of the writing process. Her essays have been published by The Writer magazine and the New York Times, and she plays fiddle in and writes lyrics for t Writer, storyteller, editrix. Author of the Anna, Banana chapter-book series, the picture books The Teacher's Pet and Watch Out for Wolf!, the YA novel Always Forever Maybe, and more. Fan of dogs and ice cream. Anica Mrose Rissi grew up on an island off the coast of Maine, where she read a lot of books and loved a lot of pets. She now tells and collects stories, makes up songs on her violin, and eats a lot of cheese with her friends in Princeton, New Jersey. As a former book editor turned full-time writer and storyteller, Anica has spoken with kids and adults across the country about all pieces of the writing process. Her essays have been published by The Writer magazine and the New York Times, and she plays fiddle in and writes lyrics for the electro-country band Owen Lake and the Tragic Loves. Anica tweets about bookish things and her dog, Arugula, at @anicarissi, which is also her handle on Instagram. Find out more at http://anicarissi.com. I wrote this book and had a lot of fun doing it. What's it about? A sleepover! Secrets! Truth or Dare! Older sisters! Supersparkly nail polish! Silly surprises! A cat named Mewsic! 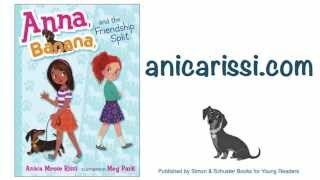 And Anna, her two best friends, and her dog, Banana, of course. This i I wrote this book and had a lot of fun doing it. What's it about? A sleepover! Secrets! Truth or Dare! Older sisters! Supersparkly nail polish! Silly surprises! A cat named Mewsic! And Anna, her two best friends, and her dog, Banana, of course. Hi! I wrote this book, and had a lot of fun doing it. It’s about a teacher who is so enamored of the new class pet, he can’t see all the trouble it’s causing. Mr. Stricter is perhaps my most autobiographical character yet. I’m not an elementary-schoo Hi! I wrote this book, and had a lot of fun doing it. It’s about a teacher who is so enamored of the new class pet, he can’t see all the trouble it’s causing. Mr. Stricter is perhaps my most autobiographical character yet. I’m not an elementary-school teacher, and I’ve never (yet) been swallowed whole (or sneezed back out) by a creature like Bruno, but I am wildly in love with my own adorable but not always entirely well-behaved pet (my long-legged hound dog, Arugula). Fun fact: Picture book authors and illustrators almost always work separately, and even though I wrote this book, I didn't know that Bruno, the class pet, would turn out to be a [species redacted] until I saw the first round of Zachariah OHora's hilarious artwork. When the early sketches for the story arrived in my inbox, my heart exploded with happiness and I laughed with surprise—I never would have guessed that a tadpole would grow into a [!!!!!]. (Though I knew, of course, that Bruno would not be a regular frog.) I love the extra layers—and humor—Zach's visual story adds to the text. We’d love your help. Let us know what’s wrong with this preview of Rayne & Delilah's Midnite Matinee by Jeff Zentner. Did you enjoy the Vegetarian? I was impressed by the novel. Fun to see your reading log. When do you have time to write? All is going well with LIT.